My passion in the wine industry is finding wines that represent the place where they are made. 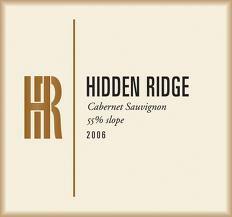 With that said, I'd like to start of this post by saying that Hidden Ridge makes delicious and distinctive mountain fruit wines. These wines have a tannin structure that pulls on the palate, but also contain a rich fruit concentration that is only found on the steep slopes of the famous mountain ranges that surround the Napa and Sonoma valley. 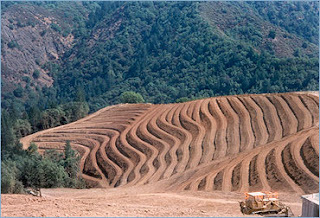 Hidden Ridge Vineyard lies between Mount Hood and Diamond Mountain in the Mayacamas mountain range and is located in some of the highest elevations known to vintners on the California coast line. Elevations range from 900’ – 1700’ and surrounding mountain peaks rise to 2400’ and give shelter to the 55 acre vineyard giving rise to its name – Hidden Ridge. I recently had the chance to sit down with Proprietor's Lynn Hofacket and Casidy Ward, and discuss what makes Hidden Ridge special to them, and why they believe so firmly that this young and brilliant vineyard holds such a special distinction amongst all the rest of California wines. The overall sense I got from them and from tasting the wines is that Hidden Ridge is serious mountain wine, with serious passion behind their vision. They focus on powerfully structured Cabernet Sauvignon, that shows the character of the vineyard site. All three of the wines tasted were incredibly dark and dense in color, with only the slightest differences from the vintage change with the 07's being a tad bit more purple than the 06'. They were wines with intense color and deep opaque cores in the wine glass. On the nose the 2006 Cab' had a very savory character and almost a slight muskiness. I got aromas of black currant, blackberry, graphite, black licorice, and hints of clay. When the wine began to open up in the glass, more of the red fruit aromas started to emerge as well as hints of earth and wet forest floor. When we talked about these secondary aromas, Casidy described the ruff terrain around the vineyard and all the different types of trees and plant life that perhaps had an impact on the way the soil is expressed through the berries. On the palate the wine was rich and opulent, and showed coursing flavors of blackberry, cassis, and chocolate. The tannin structure was very firm as to be expected from a mountain wine, however the 06' was very much the most integrated and soft of the three wines tasted. This wine was slightly perplexing to me in the first 15 minutes of it being in my glass.....Then without notice in blossomed into the best bouquet of the night!! On the palate I got intense black fruits and some really nice pomegranate notes that I thought were quite exotic. The chocolate flavors were very much present once again in this wine, but I would say they were more of a unsweetened version. The finish is very extended and has some tart mixed berry notes. This reserve bottling I felt was still a bit closed down on the nose, but really had the most silky smooth tactile sensation of all three of the wines. I adore when vintners can get Cabernet Sauvignon to glide across my palate in this fashion, and if the wine says reserve on the label, I almost need this silk for me to be completely convinced of the price tag. On the nose I got dusty dark cocoa notes that combined with black fruits and hints of graphite. Once again I think that this wine needs a bit more time in the cellar before the aromatics come to full force. On the palate the wine touches down with a silky and richly textured body and delivers flavors reminiscent of red raspberry, creme de cassis liquor, milk chocolate, and black currant. There is slight hints of a graphite-type minerality to it as well, which I believe is signature to the vineyard. Great stuff...needs cellar time to reach it's full potential. 92+ points. It is always a pleasure to read your blog. Thanks for the great info, picked up 4 bottles of the 06 cab; looking forward to drinking some in a year or two.